How often do your friends or family members complain about other people to you? How often do the people in your life come to you to brag about their accomplishments? When going to your friends or family with a personal problem, how do they typically respond? They tell you "it's not your fault" or "It's not fair"
How often do your friends or family ask you how they look? i.e do you like their new outfit? haircut? pair of shoes? etc. How many people do you have secrets with that only the 2 of you know? When you offer advice to friends or family, how often do they take it? How often do your friends or family members say they are excited to introduce you to someone they know? Do you serve as a personal or professional reference for someone you consider a friend? Based on your answers, others in your life find you too negative. This may impact your personal relationship with that person. Try looking at things from a different perspective, if you can. That's easier said than done, however. Others do NOT see you as too negative. This is a good trait as who wants to be around someone who is always a downer? Your perspective can determine how much you enjoy your life and how much others enjoy being around you. Seeing things in the best light possible is a difficult task, however. 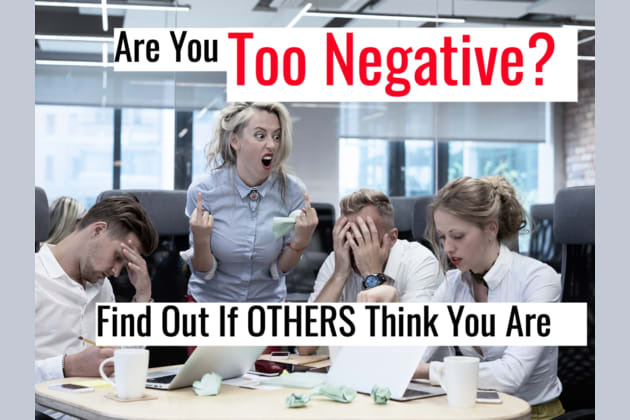 Take this quiz to find out if others feel you are too negative.